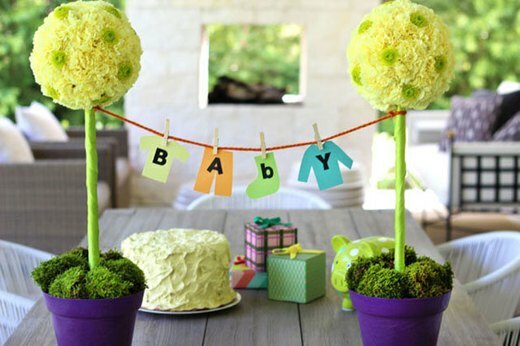 Offering to plan a baby shower for an expectant mom is a huge gesture of love--but that doesn't mean it's not overwhelming. Put your worries aside with these clever ideas and you'll be well on your way to creating a day that everyone (most of all, the guest of honor) will remember. 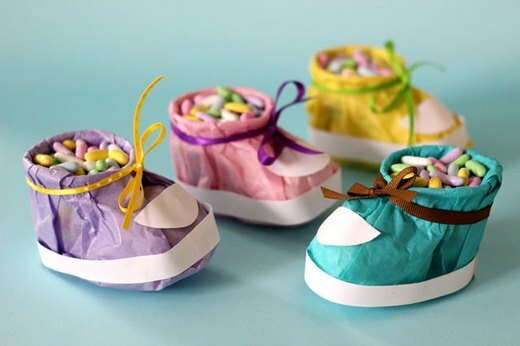 If you know how to crumple up a piece of paper and tie a ribbon, this favor will totally be up your alley. 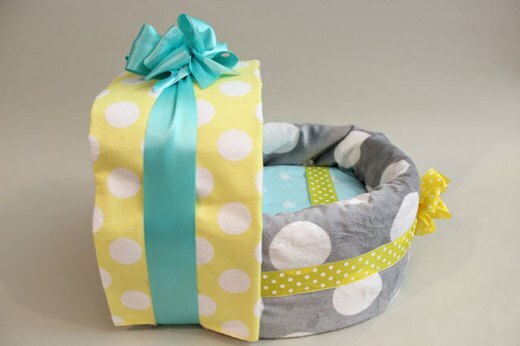 Customize the colors to match the shower’s scheme, fill them up with your favorite treats and voila, edible gifts! This DIY will bring a pop of color that impeccably personifies this day of celebration. 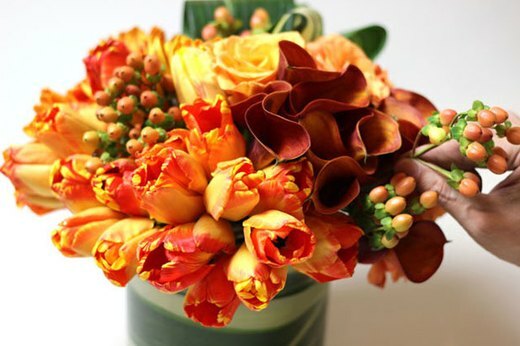 Both silk flowers and real blooms work, so the choice is yours. If you're looking to dial up the impact, opt for a bigger foam ball and hang it over a long table, or go for several small ones spread throughout the scene for an intimate setting. There's nothing like a good party popper to epitomize major celebration. These DIY confetti poppers are not only fun, but they're also pretty enough to be seen in photos (hello, action shots!). Your guests will have such a blast popping these open, that one may just not be enough. Expect to receive all sorts of compliments when everyone finds out you made this carriage by hand. The best part is the mom-to-be can take it home after the festivity and use the parts (a.k.a. blankets and diapers) once the baby is born. 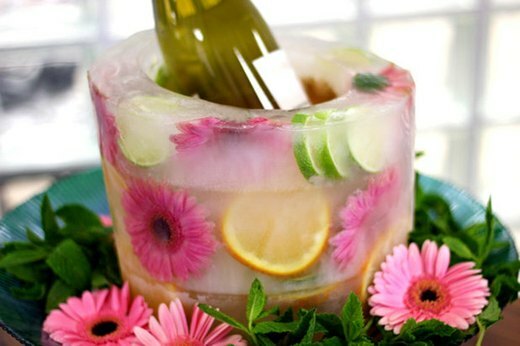 This ice bucket--literally made of ice--not only looks gorgeous but also keeps that bottle of bubbly for making Mimosas extra cold. Swap the daisies out for roses or any flower that's sturdy enough to hold its shape in the freezing process. Make a colorful statement with varying hues or go monochromatic for a look that's chic and streamlined. 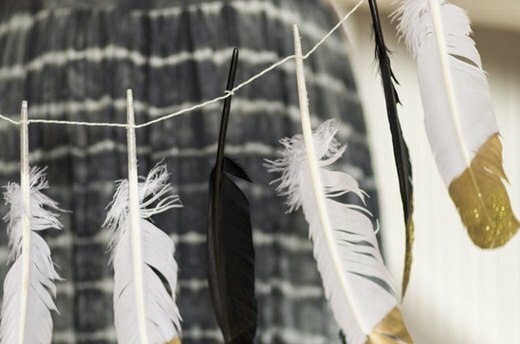 Fashion a beautiful backdrop for photos with this Pinterest-worthy garland. A little bit of nature, a little bit of bling, and a whole lot more fun than an empty wall. You can even hang them on the main table as a glam focal point to the room. With all the bright pops of color embellishing the space, this burlap runner will be a welcome addition that neutralizes the look (it’s all about balance). 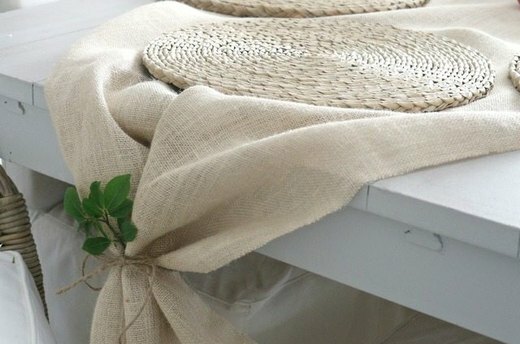 Tying the ends with twine or ribbon lends unexpected texture. Create your own distinctive topiary using some plaster, dowels, and foam balls. It’s a standout centerpiece perfect for the gift table or flanked on each end of a long dining table. These balloons are so easy to make, it’s a wonder why we hadn’t done them before. 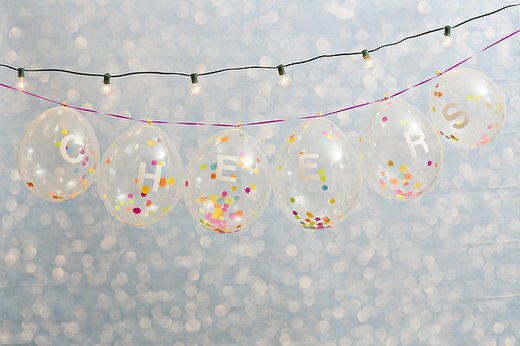 Make your own confetti (you can even go for a little metallic sparkle if you want), stuff them inside a clear balloon, inflate it, and you’re done! Going al fresco? 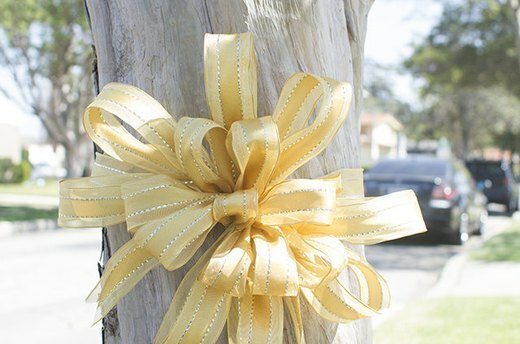 Make a statement with oversized ribbons tied around a tree. Stick with something sheer for the warmer months and flocked velvet for cooler months. Send your guests home with thoughtful favors that last well beyond that day. These mini succulent planters are adorable and also signify the new life that’s about to be born. It’s the little touches that take a party from just nice-enough to unforgettable. These stirrers will cheerfully adorn cocktails to mocktails and ensure everyone’s drinks will be stirred to their liking. Learn the ways of a pro and never pay for an expensive arrangement again. Go for a single color to eliminate any doubts you may have about what shades look good together (orange is always a good scene stealer, and white or green are sophisticated). 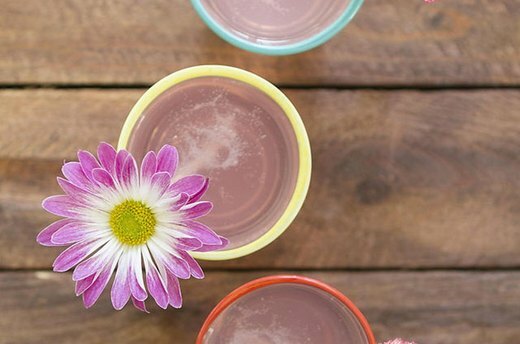 Once you nail this down, trust us, you’ll want to DIY this for all your special occasions. Sure, a lush bunch of peonies and ranunculus can be elegant but if your options for real blooms are limited, try these no-fuss tissue paper flowers. 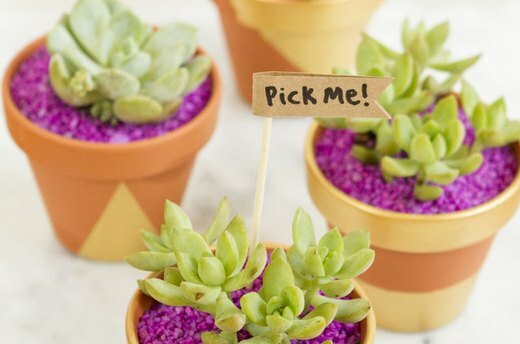 They’re fun to make, customizable, and require no watering (and a lot cheaper than the real thing!). You would never guess these blocks were made from your run-of-the-mill juice carton. 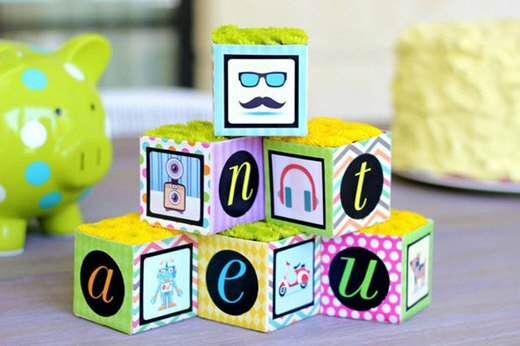 Stack them up for a centerpiece or as a place card alternative with customized letters for each guest. Add a dose of botanical charm with this whimsical garland. It brings a cheery atmosphere that’s fit for the baby theme at hand. Whether you drape it behind the cake table or hang several vertically for a photo backdrop, it’s sure to brighten up any situation (who said wall flowers were boring?). 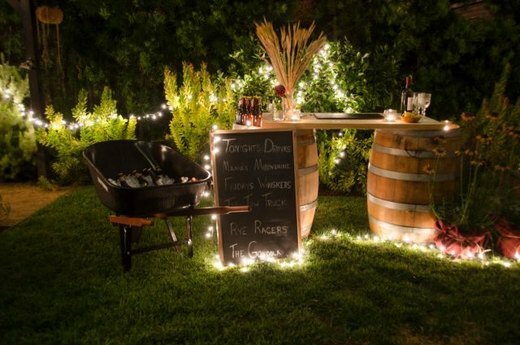 If you’re going for a chic evening baby shower, look no further than these gorgeous (and totally doable) outdoor lighting ideas. Mason jars, string lights and lace tea light holders all create an inviting atmosphere that will last throughout the night.